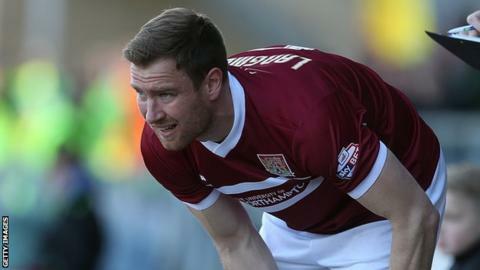 Northampton Town defender Kelvin Langmead feared his career was over after an 11-month lay-off with injury. The 29-year-old damaged a knee cartilage last season and returned in Saturday's 1-0 win over Burton. "I wasn't sure it would happen again," he told BBC Radio Northampton. "It was a huge day. For a long period the knee just didn't improve and the rehab wasn't working. We had to take a different approach and the last three or four months I've come on so well." Langmead snapped the cartilage on the back of his knee in March last year, and after attempting a comeback in the play-off semi-final in May he had to undergo surgery. The cartilage cannot be replaced and the rehabilitation has not been straightforward, but by working with Cristian Fernandez from the Cobblers medical team he has developed a way of playing and featured in the last 13 minutes at the weekend as Northampton moved closer to climbing out of the League Two relegation zone. "It's something I'm going to have to manage for the rest of my career and probably the rest of my life," said the former Shrewsbury and Peterborough centre-half. "But it felt good being out there. I was nervous about the knee and it coped absolutely fine. "I will do my Uefa coaching badge in the summer regardless. It's about putting food on the table, we're not Premier League players. "I'm still not out of the woods. I've still got a lot of work to do."